This metal framed bed raiser is width and height adjustable, providing the user with a more comfortable position whilst getting in and out of bed. 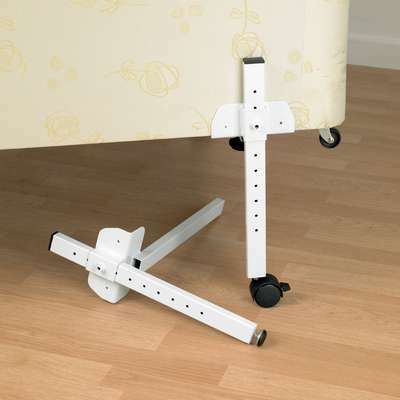 The width adjustment allows the raisers to be used on a single, double, queen or king-size bed. To keep the raiser at the required height, a grub screw is inserted into the tube using an Allen key, which is supplied. The telescopic frame is easily installed and adjusted using the black knob. The raiser is fixed to the side of the bed frame using screws for security. Supplied as a pair, one for each end of the bed.